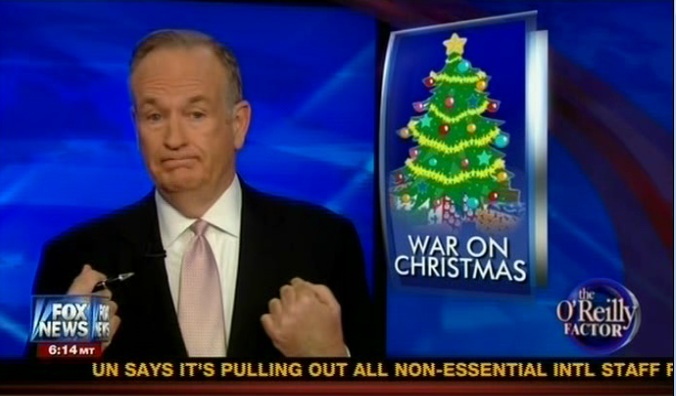 It is December again, and that means that Bill O’Reilly and other right wing ideologues are ramping up coverage of the fictional war on Christmas. During this perennial right wing outcry, right wing talkers argue that Christians cannot catch a break and that it is impossible for them to celebrate one of their largest holidays without some mean atheist obstructing them—this is said, without irony, while every shopping mall has Christmas sales, every radio station is blaring Christmas music and festive lights are put up all over town. “On the national front, there are three primary culprits seeking to diminish Christmas, the American Civil Liberties Union, the Freedom from Religion Foundation and the American Humanist Association. The most aggressive is the Freedom from Religion Foundation, which routinely threatens to sue small towns and school districts if they dare utter the word “Christmas” or allow choirs to sing carols in public schools. The war on Christmas is clearly nonsensical and is simply representative of the outrage that comes from these right wingers when they are unable to subvert the 1st Amendment and give their religion an unconstitutional sanction by the state. It isn’t a war on Christmas to follow the Constitution and refuse to give a Christian religion special status (ex. above the Jewish high holidays or the Muslim Ramadan, which are essentially ignored)—it is merely following the law. Normally, I would simply ignore the pointless outrage of the right wing over this fictional issue—they bring it up every year, bloviate for a while, and let the issue sink out of sight fairly soon after the holiday season ends, so it is pointless to argue with them—but, this time, Bill O’Reilly said something that is ironically apt in arguing against right wing attacks on contraceptive mandates. 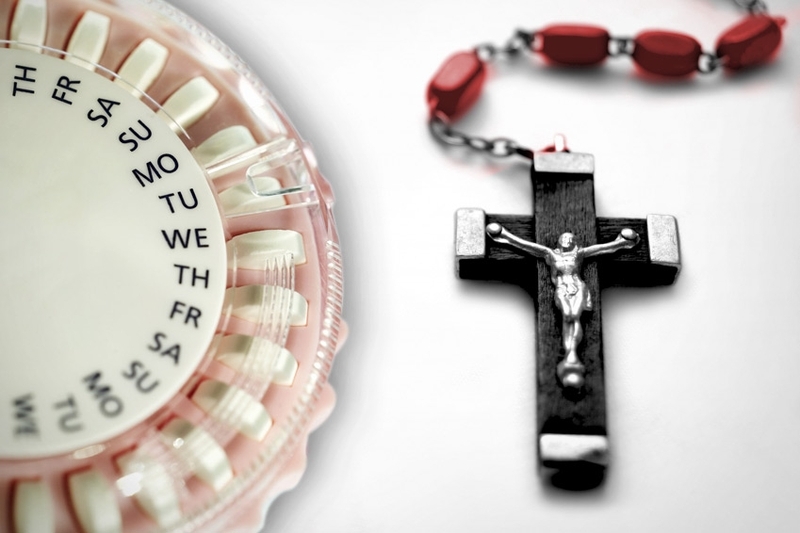 Over the past several years, the right wing has pushed against any effort to mandate that women’s contraceptives be included in all employer healthcare options alongside other common pharmacutical—they do this by saying that an employer’s religious objection to a medication should trump the employee’s right to have access to that medication under their plan. Two cases litigating this very issue are currently in front of the Supreme Court (Hobby Lobby Inc. v. Sebelius and Conestoga Wood Specialties Corp. v. Sebelius) and a ruling is expected within the year. The argument by Mr. Green assumes that a family business has the right to have a religious conscience and use the 1st Amendment to shield itself from being forced to violate its core beliefs—in short, it is based upon the idea that corporations have the same rights as the people who own them and that those rights trump the 14th Amendment equal protections guarantee given to employees. It is certainly true that the 1st Amendment prevents the government from forcing adults into medical procedures which they have religious objections to (ex. you cannot be forced to have an abortion), but that is not the case here. Under contraception mandates, employers simply need to give their employees access to contraceptives, thus nobody is being forced to actually take the pills—the mandate exists solely so that the individual can make the religious/moral choice about their contraceptives rather than their boss. Even with his own statement, Mr. Green admits that his religious choices are unaffected by the contraception mandate—he isn’t arguing that he or his family will be forced to USE birth control, merely that he will have to follow the law and make it possible for others to have the CHOICE to use contraception. In a sane world, this would be the end of the issue and Mr. Green would feel no need to impose his personal religious choices over his employees. O’Reilly should take his own advice and immediately reverse his opinions on the birth control mandate. If O’Reilly truly believes that atheists shouldn’t force their non-religion on religious people (not that his is correct in saying that they are), then he should believe that religious people shouldn’t be forcing their religion on atheists. Most atheists who disagree with Christian icons in publicly-owned areas object for the legal reason that it is unconstitutional to give preferential treatment to any one religion or even to religion over atheism. On the other hand, it is perfectly constitutional to mandate that a person have access to birth control if other medications are covered under the plan (equal protections). Insurers have agreed to supply birth control coverage for free because it cuts down on later expenses, thus the employers would have no financial liability in the issue whatsoever. We all pay to take care of common spaces and, if O’Reilly wishes to have religious icons put on the public square, it will be our tax money which goes to take care of that area and that icon—this gives every tax-paying atheist grounds to object over their money being used to subsidize religious iconography. Finally, I will agree with O’Reilly’s characterization of those who would impose their religious (or non-religious) beliefs on others as “oppressors.” The people who are trying to force their anti-contraceptive religious doctrine on women are simply wrong and, with any luck, the Supreme Court will come down on the right side of this issue. While I have little doubt that the right will continue its crusade against contraceptive on other fronts, this is one fight that sane people should win on quickly and decisively. Love the “re-use” of O’Reilly’s paragraph, turning his unfortunate mantra on it’s head. Re-blogging on Planned Parenthood FB page. Thank you. A truly “pro-life” person doesn’t and I am glad that you noticed this. I’ll check out it out. Thanks oh i just started this like 2 days ago so any tips or advice would be much appreciated.